New Year’s resolutions can be easy to make, but even with the best of intentions, they can be difficult to successfully execute. To some it could sound counter-intuitive, but you’ll want to be sure your safety commitment starts with your leaders. Empowerment of workers by leaders, good relationships between leaders and workers, and an active role by top management in safety and health positively impacts injury rates (1). To make sure these goals stick, determine tangible ways you can improve communication around safety. Is it the frequency of your communication, tools to communicate, or is it the message coming from leadership? Write down ways you want to improve your safety committee and steps you can take to support management-labor relations. Last, determine what tools or technology you will need to equip workers (from management down) to be as involved as possible in safety. Many people in your business may end up involved in safety, and that’s not necessarily a bad thing—unless it means less consistency, and more opportunity for the ball to be dropped. We can sometimes forget how much time can be “wasted” without this sort of organized, guided process in place…not to mention, how much inconsistency can be added to the process. To make sure you can become more organized and streamlined with your safety initiatives, start with the right design and standardization of your data collection. Having that streamlined, all-in-one workflow can help drive accuracy and efficiency, but it also means honest reporting of the data you collect. Whatever the tool may be to get you there, go from “I think” to “I know” in the next year with a more streamlined approach to minimizing safety incidents. That way, you can focus your time and resources on meaningful, proactive safety initiatives. Right now, are you able to look at key metrics that let you know what is really going in your culture? That might be as simple as the number of days without incidents, the number of incidents, or the type of incidents that have happened across job sites. Or, it could be larger trends or leading indicators you want to watch. To get there, think about investing in—or starting to use—tools that can help you constantly be in-the-know when it comes to the state of your culture. The litmus test of success will be when you’re able to, at a glance, see a comprehensive state of what’s going on (historical and present) and what’s next (outstanding tasks for continuous improvement). If a near-miss or accident happens, can you find out the “why” behind it? Closed tied to the last resolution, the data (or dashboard) you are using this next year should be able to tell the story of what happened. And, it should be able to help you know what to do to prevent it from happening again. To make sure this happens, start with a tool that gives you accountability and transparency. You’ll need a comprehensive reporting solution that can track incidents from entry to closure, helping you to capture details along the way to uncover the root cause. Similar to how behavioral change for an individual doesn’t happen overnight, know that for your organization, cultural change won’t happen overnight just because you have a plan to improve it. Make it a point to celebrate the wins along the way so people can feel rewarded and supported along the journey. 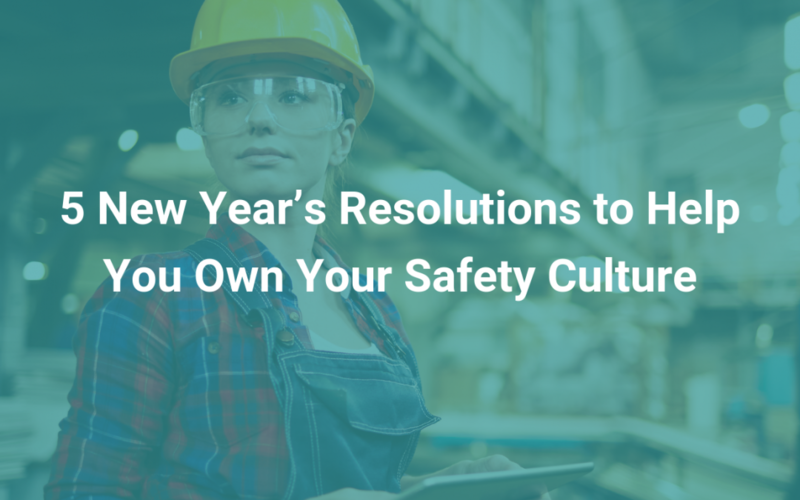 To stick with this resolution, make sure multiple (safety) leaders are on board to help, a step that can also help in shared accountability. Next, decide what behaviors or milestones you may want to celebrate or recognize. Said another way, decide what the “celebration” will be and when that information will be shared. Maybe it’s at a monthly or quarterly meeting or maybe it’s a gift that’s given out and then shared with the team. Whatever plan you commit to, make sure it’s regular, ongoing, and those milestones are shared as much as possible with the team. With iReportSource, you can equip workers to report hazards, safety suggestions, near misses, and even incident reports. That way, all your workers will have the tools necessary to capture key data through required, guided forms that make sure they collect and capture everything they need to. Giving them this kind of mobility from the field (or in the office) will reduce total time from incident to resolution. Want to learn more? Contact us today.